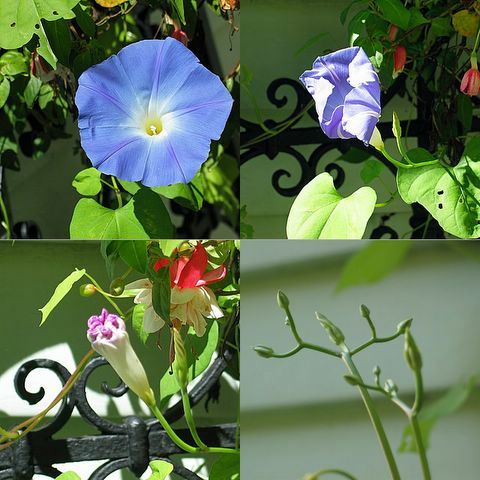 Another flower montage -t his one of a day in the life of a morning glory. I'm coming back from vacation tomorrow - look for a fresh photo from a refreshed photographer, and thanks agian to Denton for keeping Sharon Daily Photo alive while I was away! Well this certainly woke me up! I feel like I've been trumped-lol. Wondering what I have to do to see Part 1 of the cycle outside the front door. Go out earlier? Don't think it's that. Once they've budded here, they just seem to do the other 3 parts for about 4 months. Really grat to see this collage though. Still think it's funnyhow ours have those pink interiors, compared to your white. One question: what's the usual diameter size of the open bloom? And WHAT have you brought back from N.S.? Beautiful flowers. They wouldn't last a day with our desert heat.